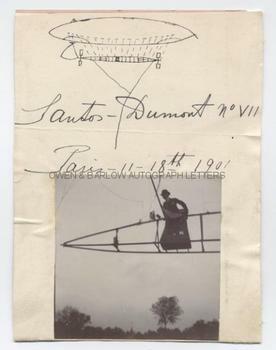 ALBERTO SANTOS-DUMONT autograph & Photograph. Brazilian pioneer aviator. The first to design, build and fly a practical dirigible. Autograph drawing of his dirigible airship, below which he has written "Santos-Dumont No.VII, Paris - 11 - 18th 1901." 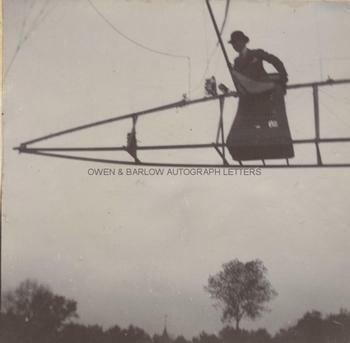 On a section of an old album leaf on which is mounted a contemporary photograph of Santos-Dumont in the basket of his flying machine, in flight. The paper piece measures approx. 6 x 4 inches. 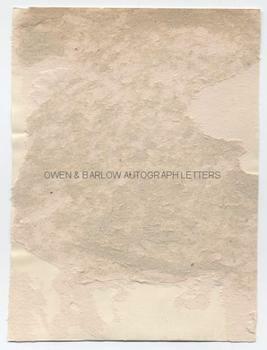 Mounting residue on verso. Very good. Alberto Santos-Dumont was really the first man to demonstrate that controlled flight was possible when he designed, built and flew an airship that succeeded in making a circuit of the Eiffel Tower in Paris. This feat won him the Deutsch de la Meurthe Prize in October 1901 and, for a time, made him, arguably the most famous man in the world. The flight was made in his Santos-Dumont No.VI and this drawing shows the design for his subsequent machine, the Santos-Dumont No.VII. Autograph material of Albert Santos-Dumont is rare.